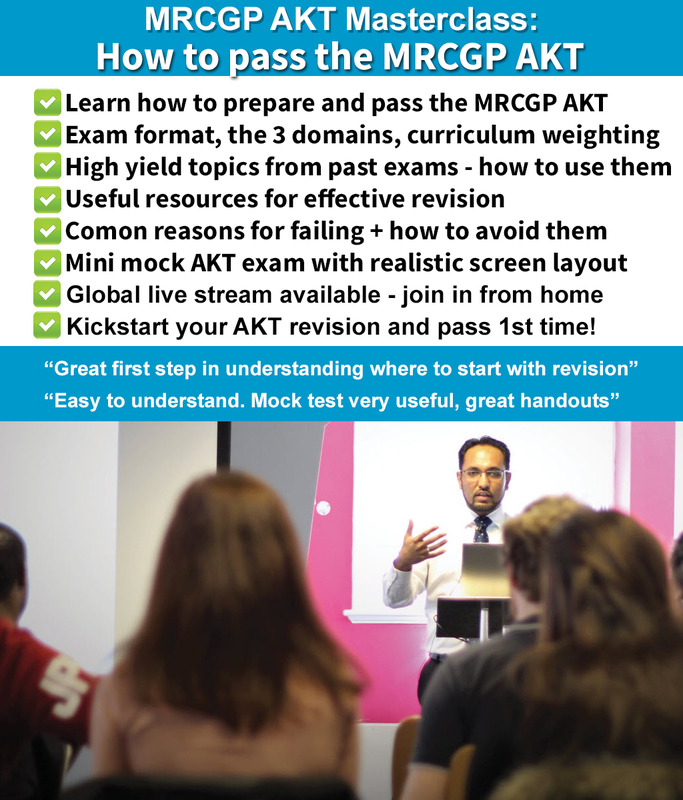 This 2 hour AKT Masterclass will help doctors in GP training understand how to prepare and pass the MRCGP AKT. It is aimed at doctors in ST1 / ST2 / ST3 that want to prepare effectively for the AKT and pass first time. It will give you a clear idea of the structure of the exam, what to expect on the day, how to prepare effectively, common mistakes that lead to failure and how to avoid them, and includes a 20 question teaching mock so you get a realistic idea of the types and level of questions in the exam. If you cannot attend the course in person, there is a global live stream available - join in from home! Having an idea of what to expect and how to prepare early on will help you plan your revision and set you on the path to passing your AKT! "Excellent course - concise, clear, covered the key topics and tips"
"Great first step in understanding where to start with revision"
"Main speaker is excellent, liked covering "why people fail" and "what examiners are looking for"
"Explained the facts clearly about the AKT"
"Easy to understand. Mock test very useful, great handouts"
"Really made me aware of the AKT...a definite eye opener"